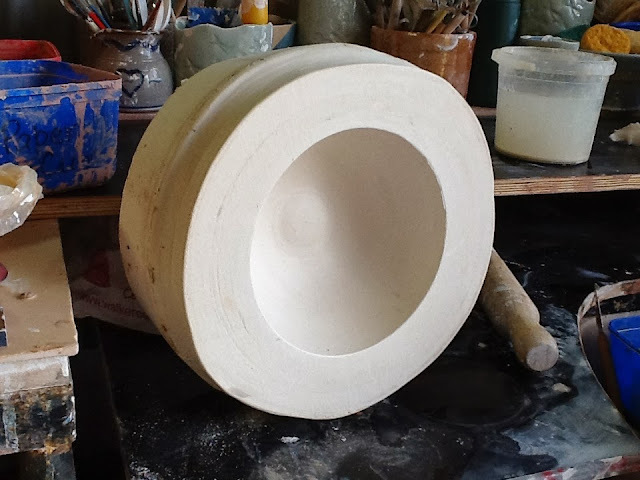 Yesterday on an impulse I decided to make a mould of a bowl that I could use for a series of work for Drift. 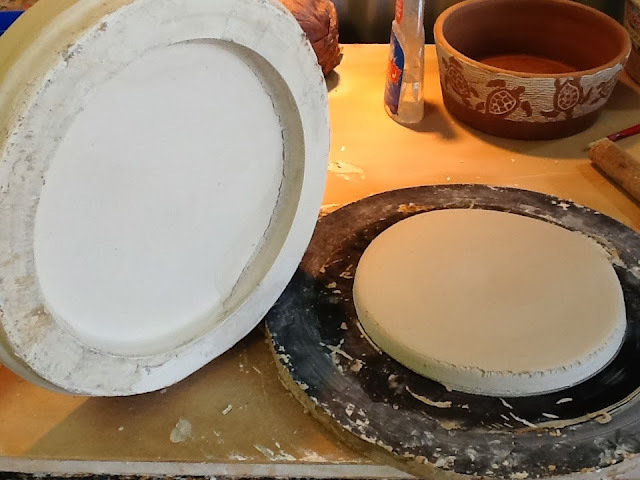 Instead of throwing bowls and then having to wait until the next day for turning them now at I am so pressed for time I thought I might be able to cast bowls in between doing other work. 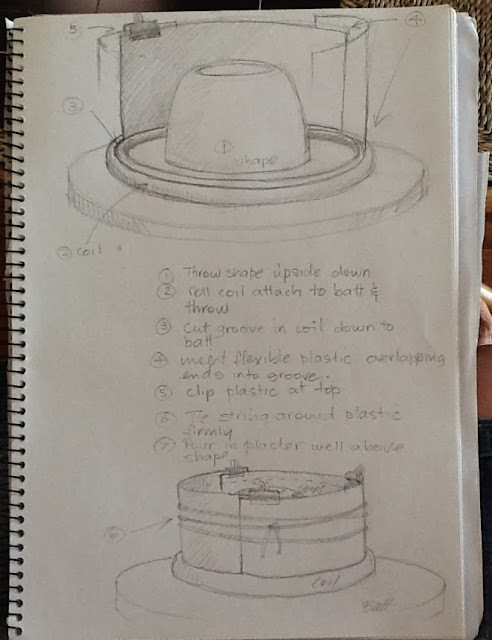 Below is my plan for making the mould. I am trying a new method and it is much easier than the way I was taught using wooden frames. The details are above but in case it isn't easily read I will repeat it. I threw the shape I desired upside down. I then rolled a coil and secured that onto the batt outside the shape. With a wooden tool I made a groove in the coil and placed some stiff but flexible plastic into the groove. I secure the plastic by turning the wheel and pressing both inside and out. The plastic is an old folder that I cut into strips. I made sure the plastic overlapped considerably and placed clips on the top where they overlapped to hold them. String was then wound around the outside, not pulling it so that it bent the plastic but to hold it securely when the mould was filled with plaster. I didn't bother to put soap on the batt for easy separation between the batt and the plaster which I really should have done as it would have made it easier. Plaster doesn't stick to clay so that was ok. 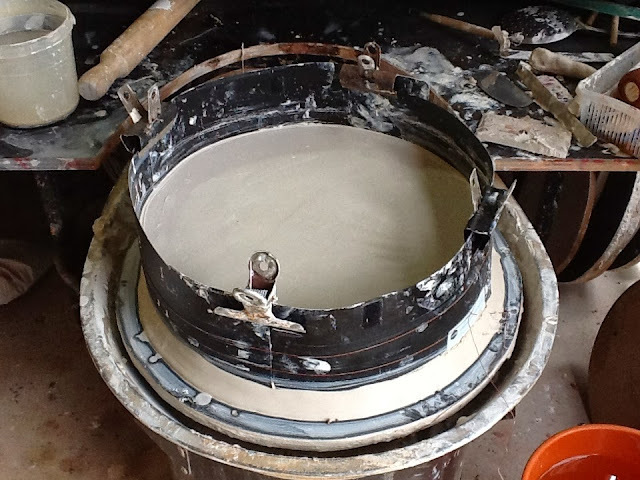 I mixed the plaster and poured it into the mould well above the shape and let it harden. I then removed the string and outside clay coil, the plastic and the rest of the clay. 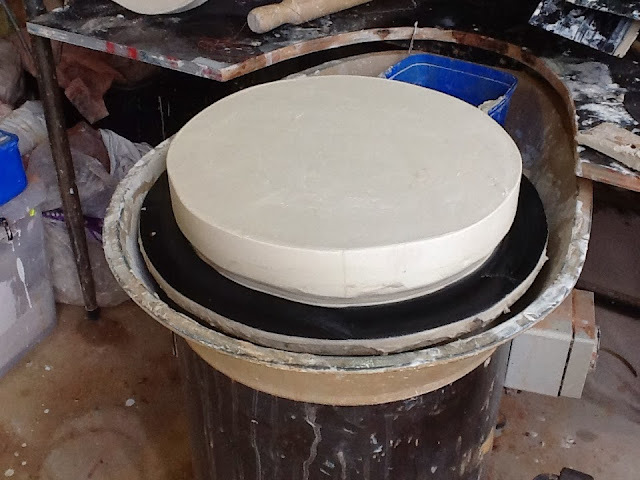 The tricky bit was getting the mould off the batt but it wasn't too difficult for the bowl, the bigger plate wasn't easy. It makes a neat mould this way. Next I made a plate shape and i followed the same procedure. 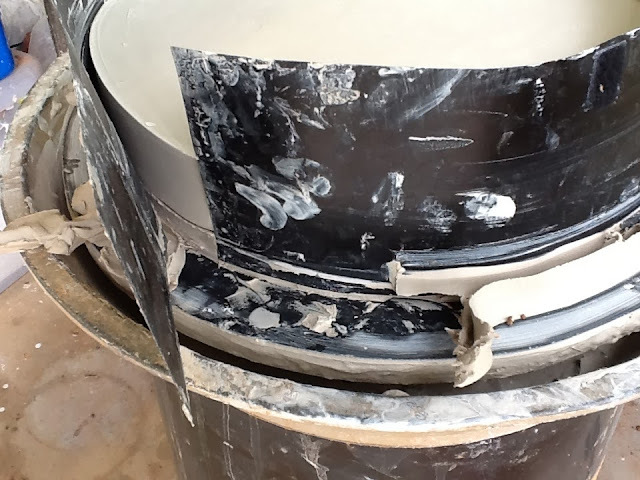 Plaster poured over shape above. Taking off the coil, clay and plastic. Looks good, but the tricky bit was next. Trying to prise the mould and shape off the batt. 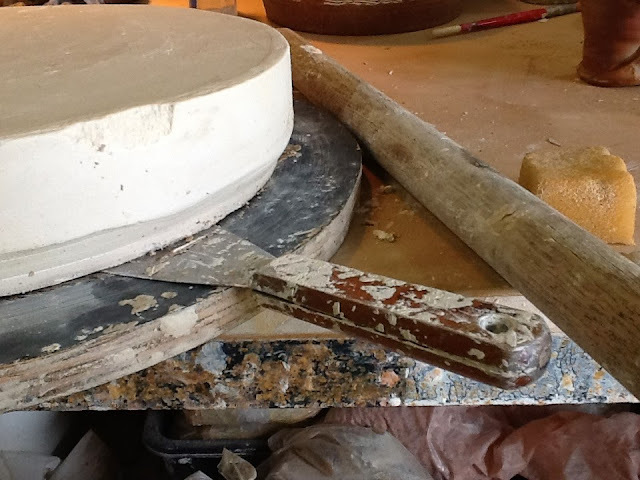 I used the round stick to whack the scraper under the mould all the way around and I did damage the edge, silly me. I am always taking foolish short cuts. Finally the mould is off the shape ready to be wiped and dried for a week. I have previously made a mug mould which I will have to dig out, hope I can find it. I am in the process of drawing whales, fish, turtles etc. I want them to look like old engravings to some degree. I could go on line and copy images but I feel that's cheating so am laboriously drawing them. I will reduce the drawings to various sizes and have decals made. It would be nice to test a series of glazes for the colours I want but for expediency this year I will use underglaze and clear glaze, fire them and add the decals. People are always wanting freebies so these shapes might be a way to fill these requests as cheaply as possible. I have Lino cuts that I can also use for a change of design. Babysitting for the next few days and a musical evening at the big boys school, the moulds will have a chance to dry in that time. I am hoping to go to this day of action on Sunday, see below. On 17th November, tens of thousands of Australians will gather in every capital city and hundreds of regional towns - tomake it clear that Australians want stronger action on climate change. Make sure you RSVP today to turn up the heat on climate action. open event - capacity of 20000 guests. WEAR HOT SUMMER COLOURS. Think red, orange, yellow - shirts, clothes, signs, banners, facepaint, hats, umbrellas and any other creative ideas. Together we will turn up the heat on climate action! Also bring water, hat and sunscreen. Labels: Mould making. National Day of Climate Action.